One way to reduce lighting system operating costs is to install more efficient components such as T8 lamps and electronic ballasts. Another is through more intelligent control of lighting. Lights that are brighter than they need to be, or ON when they could be OFF, represent another kind of waste, and another opportunity for savings. This article reviews some money-saving lighting control techniques. Some of us can still hear that parental voice saying “TURN OFF THE LIGHTS!” It’s a great idea, at home or on the job, but in busy work situations our attention tends to be elsewhere — on “more important” matters. At work, once the lights get turned on, they usually stay on. Technology has come to the rescue. Occupancy sensors — devices that know whether or not there is someone in the room — have been around for awhile now. At first they were expensive and not too reliable. During the past decade, however, their price has fallen and their performance has improved. Today, occupancy sensors have taken the place of light switches in many workplaces. There are big-city office buildings where room illumination throughout the building is controlled by hundreds, sometimes thousands, of occupancy sensors. As long as at least one person is present in a controlled area, the lights remain on. But soon after the last person leaves, the lights go off automatically. On P.E.I. the scale is different, but not the need or the opportunity. No Island company would need hundreds of these devices. But almost all could reduce their lighting bills by installing a few occupancy sensors in strategic locations. A study by the Electric Power Research Institute estimates that occupancy sensing could save 25 to 30% of the lighting bill in private offices, 35% in conference rooms, 40% in rest rooms, 60% in warehouses, and 70% in small storage rooms. Some occupancy sensors simply replace light switches, and require no additional wiring. Others are mounted overhead, either on the room’s ceiling or, in high-ceiling areas, on drop-down brackets. There are two main types of occupancy sensor. The infrared sensing type picks up infra-red (heat) radiation from human beings and other warm objects in the room, and responds to changes in the infra-red background that are produced when people move. The ultrasonic type generates sound waves in the 25 to 40 kHz range, and responds to changes in the sound-wave field that occur when people move. All types have an adjustable turn-off delay that can be manually set, typically to as long as 15 minutes. Each occurrence of motion resets this delay back to zero. Thus, continuous motion isn’t necessary. So long as the unit detects some motion at intervals less than the delay time, the lights remain on. On the negative side, frequent ON/OFF cycling of fluorescent lamps shortens their life, reducing the time between relampings. In most situations this problem can be kept within acceptable limits by choosing an appropriate turn-off delay time. Because high-intensity discharge (HID) lamps have a warmup time, and won’t instantly restart after being turned OFF, HID lighting requires special treatment. Here, special two-mode ballasts are used. These ballasts allow the lamps to operate either at full output, or at reduced output — typically 30%. In HID systems the occupancy sensor does not turn the lights completely OFF. Rather, it switches them to the low output mode. 1. The expected human activity must occur within the unit’s coverage pattern. 2. Moving air from HVAC vents can sometimes cause false triggering with both types of units. 3. Hot objects in the coverage pattern can render infra-red units ineffective. For these reasons, it is important to have your situation assessed by someone who knows how to select, position, and properly install these devices. Sometimes simply adding a few switches can save electricity dollars. If all the lights in a large room are controlled by just one switch, then the presence of even one person means that all the lights must be on. Consider sectionalizing the lighting, and controlling each section with its own switch or occupancy sensor. Dimmers are another approach to saving electricity dollars. 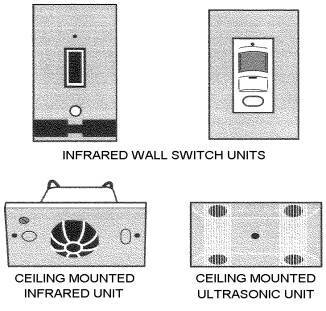 Retrofit dimmer units are available that will allow many existing electromagnetic-ballast fluorescent systems to be dimmed. These units cannot be used with electronic ballasts. If you are planning to install T8 lamps and electronic ballasts — either as a retrofit measure, or in a new facility — consider the question of dimming before you order the ballasts. Some ballast models incorporate dimming circuitry; others don’t. With few exceptions, all of a facility’s outdoor lighting — decorative, parking, safety — should be turned off in the daytime. A photocell that senses daylight is usually the best way to do this. Timeclock switches are less satisfactory because they must be reset after power outages, and several times a year as the seasons change. Photocells can also be used to control light levels in mixed daylight/artificial-light situations. These include office and workshop spaces where considerable natural light enters through a wall of windows. Other situations include greenhouse and animal raising facilities where the objective is to extend the period of natural daylight. If the fluorescent system is dimmer compatible, a photocell can adjust the system’s light output to maintain constant room illumination all day long. 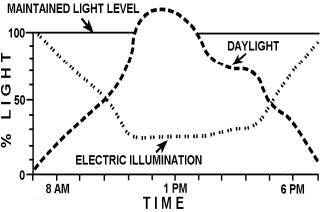 As the graph shows, full brightness fluorescent light is used at the beginning and end of the day, but is automatically reduced during periods of significant daylight. For more information about energy-efficient lighting and lighting control, contact Ron Estabrooks or Mike Proud at 1-800-236-5193 (toll free).